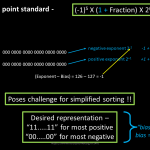 how the IEEE754 floating point standard designed the way it is. Every great design begins with an even better story. We all must have read blogs and watched videos about how to convert a decimal floating-point number to its binary form. We must have seen standard formulas of converting an IEEE754 standard floating-point number to its decimal form.